Sip from our branded Americano Mug on your daily commute. 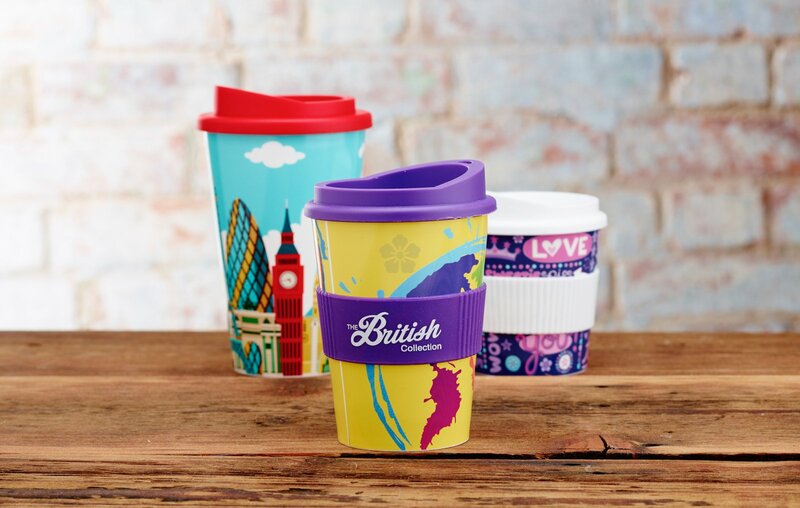 Available in 13 vibrant colours, this perky travel mug is ideal for carrying your morning pick me up or your evening hot chocolate. Supplied with a screw cap lid and rubber grip in a range of colours. Cup/Main Body made from polypropylene, dishwasher safe, microwave safe and BPA free. 35cl capacity. An all round winner and made in UK! Rubber grip is not suitable for use in dishwashers or microwaves and should be removed accordingly. Also available with a spill proof lid - POA. Prices as standard for printing to just the mug, printing to the grip is available - POA. For our 250ml option, click here. Mug is Dishwasher & Microwave safe. Made in the UK in a zero waste facility! Also available with a full colour card wrap, at extra cost. Grip: 50 x 50mm. Mug: 235 x 73mm.